Toys for All Five Senses Breastfeed.Babywear.ClothDiaper.Naturally! Baby showers and birthday parties often include a variety of toys to entertain your kiddo for hours, weeks, and even years. Some of the most timeless toys—rattles, play mats, mirrors, balls, key rings, and hanging toys—are enduring because they thrive on the action and reaction of your babe and the toy; they are dynamic. Many of them engage most of the five senses. Sophia and Fanfan rank among the popular shower gifts these days, and Dandelion makes just about the sweetest gifts I ever want to share with new mamas; HABA creates some of the cutest and most-loved toys in our home. As our sons grow, we’re also investing more and more in Eco-Kids crafty basics. Toys that encompass the senses, as well as those that invest time and energy in the making, are pivotal to engage your child’s whole experience. Sight, hearing, taste, smell, and touch are all senses that help absorb your growing baby in the surrounding world. Every experience for a baby can be eye-opening, finger-feeling fun! 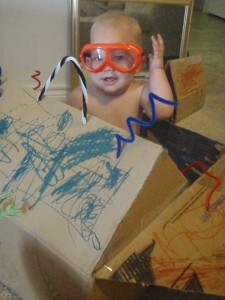 DIY toys can take moments or hours to put together but also offer unique sensory experiences. A bowl of toys or random (child-safe) kitchen items can offer the doldrums of afternoon new delights. Creating (or buying) books with ribbons, feathers, rough spots, and crackling sounds engage a baby at all levels. Include photos of family pets, family members, or common places you visit to engage a child’s memory and sight-recognition as well. A walk down the aisles of your local home improvement store offers a variety of sensory experiences. Grab (child-safe) light switches, rope, chains, locks, and other items and thoroughly attach them to a sanded piece of plywood for a sensory board that will delight your child for months to come. Use a cardboard box to create a car with a steering wheel, switches inside, a soft cloth for the seat, and then decorate together for an afternoon that encourages multi-sensory imaginative play. As with all of these ideas, be sure what you provide your babe is lead and toxic free! Also consider what is age-appropriate for your kiddo. Consider potential dangers we often forget about, like ingesting magnets, if you DIY. And don’t forget, food is food but it can, from time to time, be a toy! Whipped cream, smooshing peas, and berries as paint are just a few ideas. Make edible play dough in the kitchen together and allow your child to experience the feel of each ingredient (e.g., flour vs. salt), warm dough, and the excitement of watching a few drops of natural dye change the dough in mere moments. As your kiddo ages and the imagination takes hold, developmentally appropriate toys are the stepping stones for a child’s understanding of the world, creativity, and even some skills that can translate into deeper, fuller success in those grade-school years. This entry was posted on Tuesday, April 7th, 2015 at 11:10 am	and is filed under Children's Activities, Lynette Moran. You can follow any responses to this entry through the RSS 2.0 feed. Both comments and pings are currently closed.